We've been hard at work on our site and have recently completed a complete overhaul at www.best-ever-cookie-collection.com. If you haven't visited recently, please stop by and let us know what you think - we're very proud of the new design and hope you are too! Enter BECC's Inaugural Holiday Cookie Contest! We are very excited to share with you our very first Holiday Cookie Contest - click here to read more about it and enter your favorite cookie recipe. 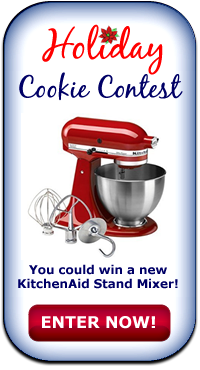 We've got some great prizes, including a brand new KitchenAid 4.5 Quart Stand Mixer to the Grand Prize Winner! 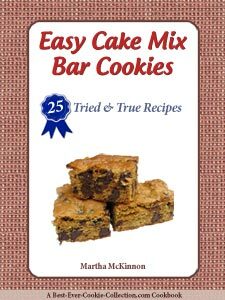 Share your favorite recipe, brag a little about it, include a nice picture and who knows - you just might take home the Grand Prize and have bragging rights as Best Ever Cookie Collection's Top Holiday Cookie Recipe of 2012! If you like Fig Newtons, you'll love this easy homemade recipe for Fig Pinwheel Cookies. They're certain to dress up your holiday dessert table! Are you looking for the perfect cookie sheet this holiday season? Keep reading for some great tips on selecting the right one for your needs. All cookie sheets are not created equal. If yours are warped, dark in color, have baked on grease, or very lightweight, you might find these hints helpful in choosing some new bakeware. Avoid dark sheets - When using dark sheets your cookies may easily overbake and you'll likely need to adjust your oven temperature down to get your cookies to come out just right. Choose the right size - You want the right size cookie sheets that properly fit inside your oven. You should have at least 1 to 2 inches of clearance around all sides. Jelly-Roll Pans - Are best used when baking bars and brownies but if used for baking cookies, they may not brown evenly. Heavy-Weight Shiny Pans - are best baking cookies. Low or no sides allow the heat to evenly bake your cookies. If you bake cookies a head of time and freeze them, be sure to thaw your cookies thoroughly in the refrigerator or on the counter, at room temperature. Leave the cookies inside their container while they are thawing or else they can easily get ruined as a result of moisture. If you are filling or frosting your cookies, make sure they are completely thawed before starting.